JWBronco did some research on swapping 2004 E150 brakes onto any Gen l Lightning. The only modifing needed is some trimming of the caliper bracket to clear the stock 17" wheel. The dual piston caliper, rotor and spindle will bolt rite up, the lug pattern is the same as is the upper and lower ball joints, even the brake line and master cylinder work with the dual piston caliper. One of the advantages is the two big 1/2" bolts that hold the caliper bracket to the spindle. 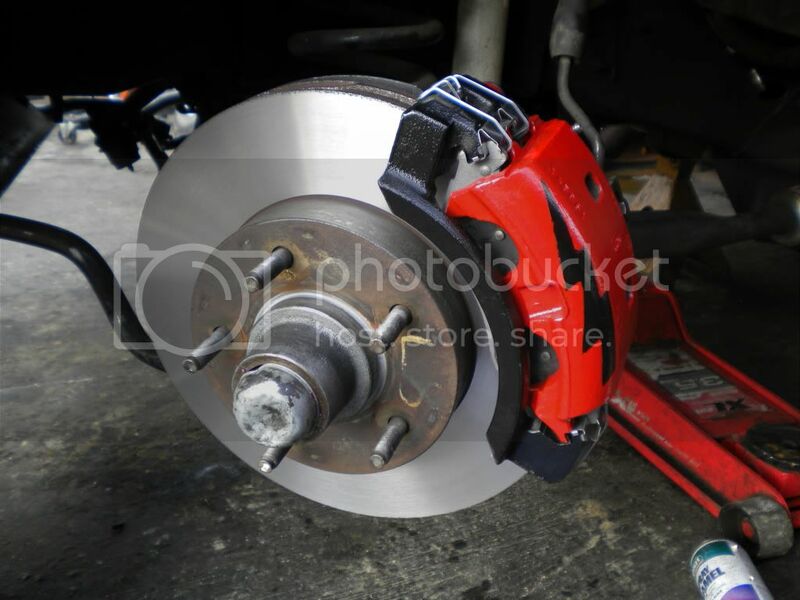 A bracket could be made to use Willwood or other 4 piston caliper.the stopping power is very noticable with stock type pads and non drilled slotted rotors. If you can find a 2004 E150 at a Pick n pull you can save money.With the 2004 spindles you can get slotted drilled rotors and make a bracket to accept willwood.the caliper bracket has to 1/2 bolts @6" some fabrication is required. The dual piston works alot better than the stock single piston. I did have to get the front end realigned, it needed a differant camber adjuster to gt it right. The first post is a bit confusing. So you buy front rotors, calipers, pads, spindles, ball joints, and just bolt it all on, or am I missing something? You will also need to get an alignment. It is just that easy. Did yu replace ball joints just because, or was it required? The lower ball joints are quite different with the exception of the dimensions of where it presses into the spindle, that is identical. Thus, you can swap old style lower ball joints into 2004 spindles. Any idea if you can run the 04 e150 rear brakes as well?